It must be an age thing. I received a nice Amazon gift certificate for my birthday and what did I get with it? A “tai-wok”…hahaha. Specifically a Joyce Chen 10-piece Excalibur wok . It was either the wok or a Braun hand-blender. But decided to get the wok because I’ve been using Su’s assorted pots and pans for several months and they are all in odd sizes and I need something big with a cover. I think the wok is the most versatile piece of cookware. As for the hand-blender, maybe another time. Well after spending my morning searching for a gift online. I should switch gear now and start reading my special education law textbook. Reno and Salt Lake, here I come! I received the confirmation today, I get to go to Salt Lake City for the National Council of Exceptional Children Convention. So I’ll be flying to Reno on March 22 , return to Lehigh on March 26, then fly to Salt Lake on April 5 and return on April 9. I’ll be presenting a poster session on the preliminary results of the survey research that I’ve been working on the past year. My advisor is the primary author and I’m the one who get the surveys printed, print the mailing labels, stuffed the envelopes and mail them out, and then enter the data and finally using SPSS to analyze the data. So the PBS research grant pays for my trip. The Dept of Special Education is booking a booth at the convention to promote the M.Ed and Ph.D program at Lehigh. And I’ll be working as a “promoter” on this free trip. 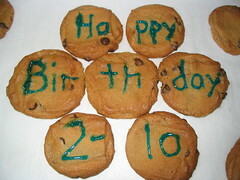 I baked this chocolate chip and peanut butter Birthday cookies for my brother just now. Have a wonderful birthday, 2-Lo! 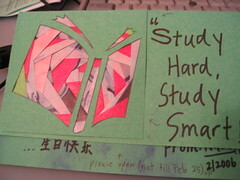 And I will have a wonderful “but have to study for midterm exam” birthday too. I received this very creative card from Nat few days ago. 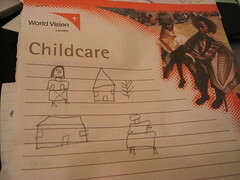 Last August, I started to sponsor a Hope Child on World Vision. The Hope Child program supports children growing up in HIV/AIDS affected community around the world, especially in Africa. What brought me to do this? Well I was watching CNN and the news of the famine in Niger was making headlines then, so I thought maybe I should do something. I got to know about World Vision sometime after the Sumatra tsunami. You could search for kids that you want to sponsor by the region they live in, gender, and/or birthdate. And not knowing where to start, I searched for a child that was born on February 25 and specifically a little girl. And I found Libuseng from Lesotho. She was born on Feb 25, 2002, so she’ll be turning 4 soon. It’s funny, there’s so many kids and how do you decide which one to sponsor? The cutest one? The saddest one? I chose Libuseng because the name sounded chinese…hahaha. Libuseng…Li Bu Seng. I have to send her a belated birthday gift and I’m thinking of sending some ribbons. Last year I sent her a picture of me and some stickers. Oh..it’s almost time to buy a cheesecake, write “Happy Birthday 2-Lo”, take a picture of the cake, and then have a nice big slice. But due to time and mobility constraints, I might just bake a nice big batch of chocolate chip and peanut butter cookies instead. Have you heard of this term, Freshman 15? In the US, they have this phenomenon called Freshman 15. Students entering college/university, in their first year, will usually put on 15 pounds due to the rich cafetaria food. And in Malaysia, I would say that we have a phenomenon called Freshman 15 too. Students lose 15 pounds in their first year due to the lousy cafetaria, chap-fun, lots of maggi-mee and the daily walkathon to and from class, especially if you’re in UPM. 3. Data analysis and preparation for poster session at the PBS conference in Reno, Nevada, on March 23. I get to go jalan-jalan Reno and the other students and I are planning to drive to Lake Tahoe for a day trip. A long time ago, during the days of teenage novels, I remember reading about the Sweet Valley twins going to Lake Tahoe for a ski trip…hahaha. 4. Qualifier to be completed by April 21. I really need to get this done by this date in order to take my comprehensive exam in September. These boots are made for walking….in the snow. Actually I just called the boots, heavy boots, because they are…heavy. Not really special snow boots. They are waterproof but the boots are not high enough so if the snow is really deep..the snow may enter the boots and melt. Continue on to my flickr site for more snowy pictures. 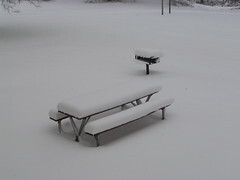 Picture taken on Feb12 at 11am. Sunday morning, church service has been cancelled. It is still snowing outside. 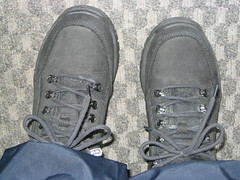 I am thinking of putting on my heavy boots and venturing outside for some snowy landscape pictures.